he Boston Archdiocese yesterday reinstated a West Bridgewater priest known as an outspoken critic of Cardinal Bernard F. Law after a nine-month investigation by church officials failed to substantiate an allegation that he had raped a boy nearly 40 years ago. The decision to reassign the Rev. Edward C. McDonagh as pastor of St. Ann Church marks the second time church officials have returned a suspended priest to active ministry after reviewing sexual molestation allegations. Still awaiting rulings are 23 other archdiocesan priests suspended since February of last year. McDonagh's case was unusual from the start. Unlike most of his colleagues who faced accusations and were promptly removed, he remained at St. Ann's for two months after his accuser contacted church officials. During that interval, McDonagh emerged as an increasingly controversial figure. Declaring himself appalled by the abuse scandal, he publicly rescinded his oath of obedience to Law - a gesture from the pulpit that received a standing ovation from parishioners - and said St. Ann's would not participate in the cardinal's Promise for Tomorrow fund-raising drive as scheduled. McDonagh, in an interview yesterday, said he didn't know if his suspension was a rebuke for his outspokenness. ''Whether or not that got me into trouble, I don't know,'' he said. 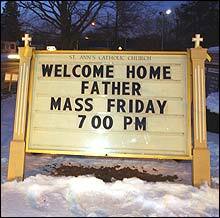 But some of his parishioners are convinced that it was. ''These allegations were trumped up to punish Fr. McDonagh for saying/doing what he did while desperately trying to make his parishioners feel a little better during these times of crisis,'' one parishioner wrote in a letter to Law that was among recently released church records. And yesterday, the Rev. Christopher J. Coyne, a church spokesman, attributed the two-month delay between receipt of the allegation against McDonagh, in March of last year, and his suspension at the end of May to confusion among archdiocesan staff attempting to manage the burgeoning clergy sexual abuse scandal. ''There was a lot of chaos in the office at that time, and unfortunately there were times when files and letters were misplaced and were not dealt with on a timely basis,'' Coyne said. The priest's case is also unusual because the accusation against him was secondhand. A woman wrote to the archdiocese to report that her brother, who had died nearly six years earlier, had told her that McDonagh molested him while he was a teenager in Incarnation parish in Melrose during the mid-1960s. The woman said in the letter that McDonagh ''raped'' her brother after her brother sought out McDonagh for counseling. McDonagh, during a meeting with church investigators last June and in an interview yesterday, denied the allegation, adding that he could not remember the teenager he was accused of molesting. McDonagh said he learned of the church's decision to return him to active ministry during an emotional meeting with Law's temporary successor, apostolic administrator Bishop Richard G. Lennon, on Jan. 24, when McDonagh reaffirmed his oath of obedience. Church officials said they waited until yesterday to announce their decision to return McDonagh to active ministry in order to give the woman who made the allegation time to object. They said the woman chose not to do so. The McDonagh announcement comes four months after the exoneration of the only other priest to be returned to active ministry since the clergy sexual abuse scandal erupted last year. Monsignor Michael Smith Foster was reinstated twice, once after his accuser dropped a lawsuit against him, and a second time after the church reexamined allegations against Foster and could not substantiate them. Some advocates for victims of clergy sexual abuse said they were uneasy with the decision to reinstate McDonagh without forwarding the allegation against him to a church tribunal charged with reviewing such claims. 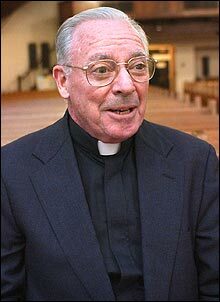 But they also said that, given the secondhand nature of the accusation, and the fact that no other accusers have stepped forward since McDonagh's suspension was announced, church officials may have had no other alternative. ''Although I am not suggesting the allegation is false, given the information the church has and the fact that it is the only accusation made... I think the decision was appropriate,'' said Wiliam J. Gately, co-coordinator of the New England chapter of the Survivors Network of those Abused by Priests. Coyne, the church spokesman, likened the church's review of the allegation against McDonagh to a grand jury investigation that does not result in criminal charges. He said he could not speak to the status of the other priests still on administrative leave, although he added that he expects to make an announcement about the reinstatement of another priest soon. Those priests who have admitted to molesting children, and those who have denied allegations substantiated by the church, will have their cases referred to a church tribunal under a policy approved by the Vatican and announced by the US Conference of Catholic Bishops in November. Under that policy, which takes effect March 1, Catholic dioceses are to establish panels comprising three to five priests that will consider child sexual abuse allegations. Monsignor Francis J. Maniscalco, the spokesman for the Conference of Bishops, said that the panels will consider written arguments presented by a ''promoter of justice,'' representing alleged victims, and an ''advocate,'' representing accused priests. The promoter of justice and the advocate will also be priests. After reviewing a case, Maniscalco said, the panels will have the authority to permanently dismiss a priest from the clerical state. And in cases in which a tribunal rules in favor of an accused priest, local bishops will still have the authority to deny an accused priest an assignment. The decisions made by the panels, Maniscalco said, can be appealed to the Vatican's Congregation of the Doctrine of the Faith, in Rome. In West Bridgewater, where parishioners have waged a letter-writing campaign on McDonagh's behalf and have prayed each Sunday evening for his return, McDonagh's supporters said they were elated by the decision to exonerate their pastor without sending his case to a newly formed church tribunal. McDonagh, 65, is scheduled to say a special Mass at 7 this evening, the 41st anniversary of his ministry, and meet with parishioners afterward. This story ran on page A1 of the Boston Globe on 2/14/2003.